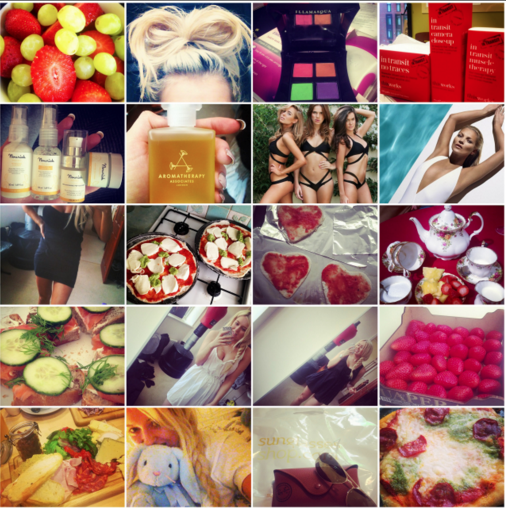 From the top left: healthy fruit breakfast / hair extensions in a bow on the top of my head / new Illamasqua Paranomal eye palette / ThisWorks In Transit goodies / Nourish skin treats / Aromatherapy Associates bath and shower oil put to the test / Kim Garners new swimwear launch = my body inspiration / Kate Moss looking amazing for St Tropez / I want my natural tan back / I made homemade healthy pizzas / Love heart pizzas made by moi / cute British tea in my garden / yummy homemade salmon bruschettas / pretty Summer dress / another Summer dress / gorgeous strawbs / British cheese platter / sleep time with Blue / gorgeous Raybans which I'll be giving away this month / the finished pizza. What are you doing this week? How has your month been? Lovely pictures why is instagram full of our pictures of food I always feel hungry when im on there. Love these photos! So understandable about the crazy timeframe! how have i just found your blog? its so lovely! could you check out mine please? Came across your blog today and I love it. Just wondering what kind of bra you wear as I struggle to buy nice bras as I have a small waist and quite big busted. I know sorry it seems a bit weird asking you this but I can never find a bra that gives a good cleavage was just wondering if you could help me? I do have a small waist (6) but I am size 34 on how to buy instagram followers and likes my back so it makes it a bit easier to find a nice bra. Stunning Pictures..Through instagram we can see many awesome pictures that can't see anywhere..Love those pictures..thanks for sharing it..